„Pizza, Bier und Stoffserviette“ lautet das bekannte Thema. This morning as I negotiated my guest office space and tied my dog to a beam supporting the roof, I hit my head, and as it cracked open, the Light of Revelation poured in. I realized that we translators have been going about setting our rates in an entirely inappropriate and negative way. And the True Path for translation rates lay clear and straight before me, its engraved paving stones making clear that if customers want discounts, they may henceforth receive them in abundance*. First off, my base rates have been reformed. My word price will be 2 euros per source word in German. A bit on the high side perhaps, but not after all the discounts that may be relevant. Those who insist on paying by the English target word will receive a 10% discount. If the job contains no handwritten text, there will be a 10% discount. If the job files are not in PDF format or some sort of bitmap or other format which cannot be overwritten electronically and they import cleanly into translation environment tools, there will be a further 10% discount. Jobs which are not a rush requiring more than 1000 words/day or 200 words/hour will be granted another 10% discount. Jobs for which the specified source language is in fact standard German from Germany and which contain no more than 1 minor text errors per 1000 words will be given another 10% discount. Specifying my native dialect (US English) as the target language earns 10% more off the base price. Customers who pay cash in advance get another 10% off. And last but not least, repeat customers qualifying for at least three of the discounts above will get another 10% reduction. So there we have it: total discounts of up to 80% available for savvy translation buyers. Betcha the Big Lion and my other competitors like BOGOF Translations aren't willing to accommodate clients that much! Last September the Association of Translation Agencies (ATA) in the Netherlands hosted a one-day conference entitled "The Future is Here". Previous guest posts have described some of the workshops presented, but I have only now received permission to repost a summary from a private translators' forum which best captures the spirit of said future. And it came to pass that the leaders of the translation industry in the Netherlands did host a gathering where visionaries and evangelists of Machine Translation did come to spread their knowledge to the truly ignorant and preach The Word to lowly translators, whom they knew as ‘workers’, for there had been much wailing and gnashing of teeth about Machine Translation. Those preachers did include the wondersome Renato Beninatto, a self-professed agent provocateur and erstwhile owner of Common Sense Advisory (and truly he is clever for he doth qualify all of his doings with the words ‘but no promises’). And so it was that the great Renato spake unto those assembled before him, to inspire them and let them be informed of the principles of Machine Translation so that they might practice them. And yea, his words fell on them like rain and they did listen to his preachings unquestioningly. One of his audience spake of quality, a truly reprehensible word, but Renato was not angry and was gentle with him and did explain to him at great length and with supreme patience why the word quality shall not be uttered, for it is verily vanity to speak of quality in thyself: quality is subjective and translators shall not allow the word quality to pass their lips, nor shall they worship at the shrine of quality; he who speaks of quality and Machine Translation in the same breath shall be cast asunder. Many of the assembled throng did agree with him wholeheartedly that this was true. And Renato was a kind preacher, for he did make no mention of the lowly translator or the need or otherwise for such a loathsome beast. And he did say unto the people before him that when the mighty computer was unable to understand or cope with the complexities of language - such as accents - those complexities would be banished in order that the computer might understand and in order that language might be ‘more present’. For he is truly a prophet and he doth know what the present means and what the future holds. His disciples did learn from the great Renato that they should practice the principles of simplification and lowest common denominator and they did learn from one of his acolytes that they should speak and write in tongues that the Machine Translation can understand, lest they receive garbled messages. The mighty Renato did also allow Jaap, another ‘visionary', to spread the Machine Translation gospel and tho Jaap did indeed attempt to extol the wonders of Machine Technology and predicted for those before him that the world shall be unrecognisable in only two years, he was lacking in charm and was unable to equal the persuasive talents of Renato. The translators could not warm to him since he spake of their labours as repetitive and did say unto them that they could not survive unless they worshipped the Machine. He did make them restless with his dire warnings that their translations memories were already obsolete and he did verily cast aspersions on even the most technological of them. And the translators did mutter amongst themselves, for they were unsure. Whilst they did acknowledge the existence of Machine Translation, they did feel that language is a truly wonderful thing that shall be treasured. Renato had preached to them that quality is a vile word that must henceforth not be spoken and that he who doth use that word should be cast asunder yet they were not persuaded. And so they left the gathering, reassured in the knowledge that theirs is a valuable profession, even though it is not valued by all of those who seek to profit from them. Yea, that is the task of the translator – that tho his is good work when it goes unnoticed, he shall not be a Doubting Thomas. He shall not be shunned for his belief in the beauty of language, for language is a truly wonderful thing and his is a truly valuable talent. When I received a message from a colleague that ProZ had begun "certifying" translation agencies with the dreaded red Plob, I thought she was joking. There are real certifications for serious businesses, verifying that their documented procedures are orderly and traceable among other things. These include ISO 9001 and EN 15038, and the more ambitious agencies usually seek these because they are required for business with some large clients or RFPs. Surely no serious translation agency would feel the need to be "certified" by The Translation Workhouse with its increasingly debased standards. Well, once again, I have learned that human greed and folly have depths which even my cynicism cannot plumb. If one goes to the ProZ home page but is not logged in, the link to these "certified" proZtitution agencies is visible. I followed it and found a list of corporate members, some well known, some with the Plob. What, I wonder, is being certified here? I am familiar with ISO 9001 and EN 15038, and I can't really imagine a lot of value that would be added here. But perhapZ the SiteStaff have developed important and relevant criteria, such as testing the timeliness of bank transfers for a specified amount. Both end customers and freelance translators would benefit from knowing that an agency using ProZ has been verified as a registered business with a working bank account. I must confess that I am not really a great fan of remote viewers and the like on principle. The technology has been around quite a while, and about the time my friends in IT tech support developed enthusiasm for doing remote maintenance, I was running from tech support roles as fast as my legs could carry me. And while I appreciate a good webinar quite a lot, even the best cannot, in my opinion, match the value of personal delivery. When I deliver a lecture or workshop I like to see the faces of the participants, read their body language, ask them questions. And software just doesn't do that well in my opinion, even when the features are there. But... I spend a lot of time on the phone explaining things to people who feel they are experiencing the inexplicable with the translation environment tools. And unfortunately not everyone uses the right descriptive terminology to give me a clear picture of the problem. So one day, while I was getting quite frustrated trying to picture what a user was doing on her screen, one of us thought of using TeamViewer (and it surely wasn't me). The quickie show & tell mutated into several hours of highly productive coaching, which was repeated on a few occasions with this person and others. I wasn't impressed with the quality of sound transmission via my UMTS data connection, but the visuals worked well. More recent tests with Netviewer left me very impressed by this platform's sound quality and features, so I may use this for coaching and remote group instruction. I still prefer to deliver workshops of several hours in person, even if it means I have to travel across half the continent to do so. I really do believe that is most effective, and I learn a great deal from talking to the participants informally about their experience. That is really missing in the online medium. But I think now when calls for help come in or a colleague needs to see exactly how a particular procedure works, we might all save time and frustration with remote technology after all. That may sound a bit Jurassic, but I really don't like to use technology unless I see a clear benefit to it which cannot be achieved by better means. Now that I have "the bug", of course, a number of useful possibilities are seeping into my mind. "Teaser demos" of presentations usually delivered in person in a longer format, for example. Whatever I end up doing with this, I am far more optimistic about the technology than I was. Have you used it as a presenter or participant? What advantages and drawbacks have you experienced? Recent posts on other blogs discussing the statistics for 2011 or longer periods aroused my curiosity regarding the figures for Translation Tribulations. These are shown below. They are, however, a bit skewed; highly popular posts discussing a bankrupt agency in Zurich and its owner's attempts at harassment and deceit were removed, presumably by commissioned hackers, and the statistics only refer to specific URL access and say nothing about how often these or other posts might have been read from the scroll of the blog's main page. I also only began collecting statistics in January 2010, long after the blog was launched in 2008 and well after several popular posts appeared. Although quite a number of these posts are rather old, only one is really without some current relevance. The perpetual concern of translators with payment issues of some sort was a significant part of half the posts. A guest post by Marc Prior, volunteer coordinator of the OmegaT project. He described improvements introduced in March 2010. Since then, this Open Source software has continued to improve in ways that now make it a professional tool to be reckoned with. 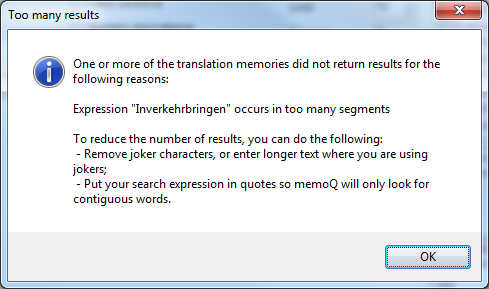 Still relevant after two years, this post offers detailed instructions on the best ways to translate SDL Trados TagEditor (TTX) files in memoQ. One major advantage of this approach is counting of and easy translation access to numbers and numeric dates. A post based on confusion regarding the impending release of the new SDL Trados software with a modern interface. Not really deserving of a "Top Ten" slot, its ranking shows the great interest that accompanies cost concerns about Trados software. For the record, I have seen a lot of improvement in SDL's software and policies since this post went up. How low can ProZ go? A very recent post which quickly became one of the most viewed ever. The post and comments reveal why the Blue Board ratings should be taken with a truckload of salt and suggest where one might find reliable sources for investigating the payment practices of translation agencies. Tips on text counts for the latest version of Microsoft Word. Practical corpus linguistics has been a personal interest of mine for a long time, as it constitutes one of the best methods for developing specific domain terminologies in an efficient manner. Since I first laid hands on "Working with Specialized Language: A practical guide to using corpora" by Lynne Bowker and Jennifer Pearson (ISBN 0-415-23699-1) I have enjoyed great benefits from this approach. So when a discussion thread on a private translators' site mentioned a follow-up to a talk last autumn on legal corpus utilization for terminology research, my attention was drawn to it immediately. The information is reproduced here in slightly modified form with the permission of the person in charge of the project. The blog mentioned in the text is worth a look as well. At the Lisbon Tradulinguas conference in October, I ran a workshop on terminology, presenting a methodology that I am testing - called NIFTY - which applies to all language pairs. This message is addressed to people who attended the workshop, those who tried out the method using the conference CD, or anyone who would like to try it out now. I would really appreciate any feedback that you can give me - it's really important for my project to have input from professional legal translators - this is NOT an ivory tower experiment! Of course no names will be cited in any reports of the results - participants will remain anonymous. 1) I have set up simple online forms that are really fast to complete. First you just complete some basic questions about your profile (it can be anonymous - just use a false name if you prefer) - this helps me to understand what sort of translators find the process useful or not. 2) You can give me your feedback by email in extended text form. Of course I am here to help if you need any assistance or advice on using the NIFTY tools. N.B. The survey platform is fully compliant with the US-EU Safe Harbor Framework as set forth by the U.S. Department of Commerce regarding the collection, use, and retention of personal information from European Union member countries. The PhD project itself has been reviewed by the University of Portsmouth Faculty of Humanities and Social Sciences Research Ethics Committee. Filling out the initial form indicating interest is a relatively painless process; it took about 5 or 10 minutes of my time. I am curious to see how her methods differ from my current practice and what I can learn here. “English is a first language for many different language communities across the world and is changing all the time. So many people use English for so many different purposes every day that it is not at all surprising that at any one point in time there is massive linguistic variation. Indeed, ‘Englishes’ rather than ‘English’ is the name of the game, and anyone responsible for preparing English texts ready for publication needs to be aware of this variation in usage, so as to be able to make appropriate decisions and produce stylistically balanced texts which are fit for purpose. Often, however, people are uncertain and conflicting stories abound. These are the topics that Mike Hannay will be addressing in his one-day course on March 9, 2012 for which registration is now open. Apart from looking in detail at specific usage issues (based in part on your own experience and suggestions), Mike will also be examining how translators and editors can best deal with matters of language variation. The venue is Regardz Eenhoorn Amersfoort. The course lasts from 9:45 a.m. to 5:15 p.m. and qualifies for 6 PE points. The usual early-bird discount of €50 applies (until February 13). Please see http://www.teamwork-vertaalworkshops.nl/events/evenement.php?id=43 for full information. Are professional organizations worth the bother? There are two broad categories of professional organizations potentially of interest to language professionals such as interpreters and translators: those which are intended specifically for providers of language services, such as freelance translator and interpreters, and those which are not. The latter, which would include chambers of commerce, business clubs, technical societies such as the American Chemical Society and so on are clearly of great value. They are a means to stay abreast of new developments in areas of interest (perhaps an earlier profession) and perhaps to meet potential direct clients. Fortunately, the real world isn't quite as Dickensian as that, though perhaps a bit darker and more Satanic at the wordface in some parts of the world. But King Henry's sockpuppet is partly right: all organizations are not created equal. They exist in a particular social context of the countries in which their members live or do business, and they are very much dependent on the efforts of their members. The professional translators' organization of which I am a member, the German BDÜ, can be a real mixed bag at times; one fellow I know who places enormous value on professional conduct quit his local chapter in disgust a few years ago, referring to it as the Hessian Housewives' Association. Since then, however, he has come back and contributed to the serious business focus of his state chapter, and across Germany the organization offers first-rate continuing education seminars, free legal counseling, affordable liability insurance, an excellent private forum for members to exchange information and job requests, a superb online search tool for translators and their specialties and more. To say that I get my money's worth out of membership would be a huge understatement. I don't have to like everything the BDÜ does, but I applaud a great deal of it. As I was compiling the list of professional organizations for freelance translators and interpreters which provide online search tools for potential clients to find a service provider, I was a little shocked at how parochial and unprofessional some of these venerable organizations appear on the Internet sites. In a discussion of that list on a private site, one colleague commented that it is a shame there isn't some sort of meta search engine to serve up the data from a great number of professional sites around the globe. I'm not really sure that would be a good thing if it were possible, and a quick look at the search tools for a few of the association sites quickly makes it clear that a programmer attempting such a task would soon turn to the bottle. There is no consistency at all in the lists of specialties used; some organizations simply list members in a given region with no statement of the types of text they feel they are fit to translate. Appalling. Linking online search engines for the associations would require using the same list of specialties or at least subsets thereof to be effective. But what chance of that is there with an organization that feels it is important to list beekeeping but nothing to do with chemistry or chemical technology? Quite a lot, I'm sure. Unifying and merging search tools might be a good project for groups like the Canadian umbrella organization I listed. I was not happy to see that I would have to go to each individual state organization to do my search. Really! This is the 21st century, but some organizations for language specialists seem to be stuck in the 19th. The disorganization one can see in some areas, even in developed countries where one might expect better, make it obvious why even a highly flawed commercial portal that many serious professionals avoid like herpes can be a "success". But fortunately, there are some organizations, big ones, that get it and offer a hunting ground that is generally happier than the portalZ with their spotty or non-existent identity verifications for members and silly aliases. Mind you, I eventually adopted an alias myself on ProZ, but that was to avoid having information I wanted to present about myself or my business get buried in spammy pages repeating my commentary for Tamil, Swahili, Tagalog, Urdu and other languages at the center of the world stage. So are these professional organizations for language service providers such as freelance translators, interpreters and editors worthwhile? Definitely. If you choose the right one. The Great Firewall of Washington! Slowly I am beginning to understand the association of the color red with the Republican Party in the United States. Before the 2000 presidential election, red and blue had no fixed association with Democrats or Republicans, and when I thought of the color red at all in the years after that I was usually seeing red because of Republican policies designed to dismantle the country or all the blood, foreign and domestic, which Republican lawmakers and Republican wannabes like "blue dog" Democrats so happily see shed. But slowly the truth is emerging from the fog of the Bush wars: the Chinese connection. Ol' Shrub & Co. happily financed their military adventures with Chinese money, now it seems that Republican lawmakers, following the lead of their Red Chinese masters, want to erect a Great Firewall in Washington to strangle free expression. Beijing disapproves of dangerous ideas like the First Amendment to the US Constitution, so their eager Red Party students in the US House of Representatives and Senate SOPA and PIPA respectively to set things right, based on the hollow premise of preventing copyright violation. President Obama has stated his opposition to the legislation now proposed; let's hope he doesn't roll over and play dead for the Reds as he is wont to do. 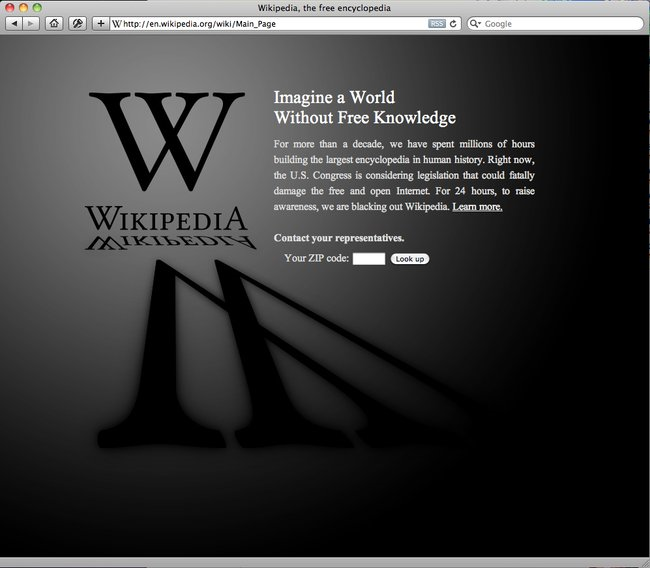 As part of the protest against US legislators' attempts to strangle free expression through unconstitutional preemptive restraints and other measures, Wikipedia will be blacking out its English pages worldwide tomorrow. Wikipedia, like any other Internet-based platform exists within and is affected by the framework of laws, and I find it entirely appropriate that this otherwise neutral platform stand up and take a position in this matter. Details regarding the blackout, scheduled to begin at 5:00 am UTC on January 18, 2012 and continue for 24 hours, will be found here. We as translators depend very often on the public availability of information for our work. Intellectual property should have appropriate protection, but the Stop Online Piracy Act (SOPA) in the U.S. House of Representatives, and the PROTECT IP Act (PIPA) in the U.S. Senate are not the way forward. If you are a US voter, please make this clear to your erected representatives. Das Gasthaus befindet sich direkt gegenüber vom S-Bahn-Ausgang auf der anderen Straßenseite und ist nicht zu verfehlen. Sagt doch kurz Bescheid, ob ihr dabei seid oder nicht. Die Referentin Susanne Murawski arbeitet seit 25 Jahren als Technische Redakteurin, Projekt- und Abteilungsleiterin für Technische Dokumentation. Die Referentin Jutta Witzel ist Fachjournalistin, Projektleiterin und Trainerin. Seit 2004 ist Jutta Witzel hauptberuflich Fachjournalistin für die Themen Sprache, Interkulturalität und Diversity Management. Die journalistische Qualifikation erwarb sie durch Seminare beim Deutschen Journalisten-Verband, dem Deutschen Zeitschriftenverlegerverband und der Bayerischen Akademie der Presse. Die Seminare finden in Berlin statt. Der Frühbucherpreis beträgt für BDÜ-Mitglieder 525 Euro pro Seminar (Der Frühbucherpreis ist gültig bis zum 2.2.12. für das Seminar zur technischen Dokumentation und bis zum 1.3.12 für das Seminar zum Übersetzen journalistischer Texte). Im Preis enthalten sind Tagungsgetränke, Kaffeepausen, Mittagessen (inkl. 1 alkoholfreiem Getränk), Skripte sowie die gesetzliche Mehrwertsteuer. Over the past decade I've spent many hundreds of hours helping clients and colleagues find suitable translators to collaborate on their projects, mostly involving German and English, but occasionally venturing into other languages such as French, Spanish, Russian, Chinese or even Vietnamese and Sinhalese. Unfortunately, it can be said that "many are called [translators], but few... [should be] chosen." For various reasons. In desperation, many turn to public commercial portals such as ProZ aka PrAdZ aka The Translators' Workhouse or perhaps more benign incarnations of the same concept. Some of these pretend to screen "professionals", but as in another old commercial profession, the main criterion in proZtitution is to see if a trick can be turned and a Google Ad dollar made or the like. One of the Zertified Red Pros I've seen on PrAdZ is well known to me from the twenty hours I spent preparing an expert opinion for possible legal action by his client due to gross incompetence and damage to business relations; others are of similar caliber. Yet many translation agencies continue to drink from those soiled troughs, where anyone with an Internet connection and a knowledge of the URL http://translate.google.com/ can hang out a virtual shingle as a translator; occasionally a corporate client unknowingly falls in and drowns as well. Mind you, there are still a few very good translators to be found in such places, but they are getting fewer and fewer, verra hard tae find. The few grains of wheat are buried in a mountain of chaff and bird dung. Many clever translation buyers (translation agencies, corporations great and small, law offices, and individuals) know the open secret to finding a better class of translator: professional association directories. Sure, you can find rotten eggs in those nests too, but on the whole, these are far more serious professionals, most of whom actually make a living as translators and perform to standards that will enable to keep them doing so as long as they like. Not the desperate unemployed, the frustrated actors or journalists who can't get enough work to pay the rent, starving studentZ or bored house hubbies. Where do you find contact lists for these professionals to find the "right" one with the special knowledge you need? Here. I'll keep a running list of professional organizations around the world and links to their online directories. I know only a few myself, because my interests are limited to a few languages and countries; some of these have been kindly provided to me by international professional colleagues who know the organizations intimately and are in some cases involved with running some part of them. If you are looking for competent people, certified or otherwise, these are very good places to start your quest. It is more likely to have a happy end or a happy working relationship for the years ahead. I'll add listings as I receive them and perhaps a short comment by members I know if they care to share them. When these organizations mention certifications, it means something more than a little red pee. Here there are links to the regional organizations and their directories (print or online). 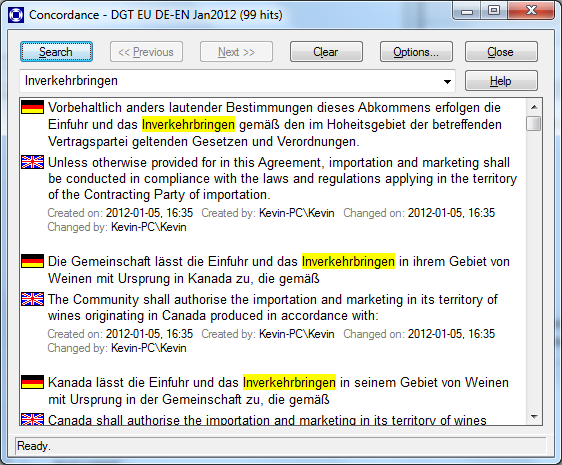 It's a bit fragmented; the group in British Columbia, for example, has separate directories for "certified" and associate members. Too bad they can't offer a nationwide directory in this modern age, but as they say, "seek and ye shall find", and the findings are surely better than what one would typically turn up at a commercial portal without standards. BDÜ - home page (in English here). National scope. The site's programming is primitive (still uses HTML frames!!! ), so the directory will have to be accessed from the home page. You can't miss it though: a link with a big magnifying glass at the top of the page and large, bold words that say "search online for interpreters and translators". The cream of the German crop will usually be found here. ADÜ Nord - home page (in German). More focused on the northern region. The online search form for translators is on the home page, impossible to miss. There are great language service providers to be found here. ITI - home page - unfortunately, these Brits are just as primitive with their HTML site structure, so the online directory must be accessed in a frame on the home page. Still, the link is at the top of the page and easy to find, and there are a lot of excellent translators to be found here. I know I don't need to tell you how bad ProZ is for the industry, and I don't want to turn this into a discussion about that site, but if you need a little story to convince others to stop supporting ProZ with their money, here's a funny one from today. A while ago I did one project for an agency that turned out to be a typical broker. Absolutely no QA, low rates (earlier, they were looking for a 50K legal translation within 2 days for 0.09 USD/word - without adding any value to the project themselves), and so on. The project was small enough for me to use as a test to determine if I wanted to continue working with this guy. After all, he had 30 5-star ratings on the Blue Board. But as it turned out, my initial feeling was correct: he sent me three emails way before the deadline asking me when I would deliver, but when it came to paying me with equal speed after timely delivery, the excuses and bossy behavior began. He said I should be happy about getting paid after 30 days because that is supposedly "GREAT" in our industry, and he declared that he was under no obligation to pay me when I wanted to be paid, etc. So, long story short, I went to ProZ to leave a negative rating. My review included all necessary information and described my experience. I didn't mention any names, nor did I use foul language or similar. First attempt: my review got censored and deleted without any explanation. I sent a support request and asked what was going on. Got a reply that told me to resubmit my review. Second attempt: I resubmitted my review, and removed the word "arrogant" from it, just to be sure. It got censored and deleted again, without any explanation. Third attempt: I simply selected one star and added "Not recommended." to the comment field. It got censored and deleted again. This time, I received an email telling me that I was not allowed to add any comments and should only indicate my WWA rating. WTF?? If you see a bad rating, don't you want to know why the rating is so bad? Leaving a bad rating without any explanation makes the translator look bitter and vengeful. And why are comments allowed for the good ratings then? Thank you to colleague Christian Taube for pointing me to another interesting public dataset, the parallel corpus of UN General Assembly resolutions available in TMX format in English, Russian, French, Arabic, Chinese and Spanish. All six languages are in the same TMX file. Altogether there are over 72,000 entries. Not a big collection compared to the EU DGT data, but possibly of better quality and certainly useful for those whose translations relate to the subject matter and involve pairs drawn from these six languages. 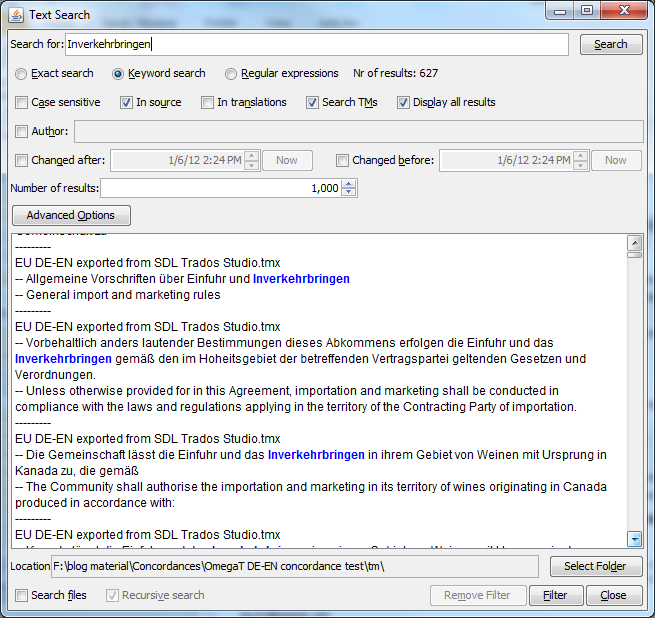 To use this data in OmegaT, the desired language pair must first be extracted with another tool to create a bilingual TMX file (as opposed to the hexalingual one). 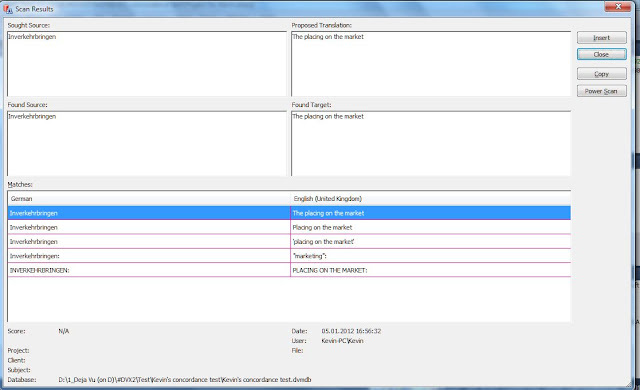 I exported the data I had brought into memoQ to make an English/Russian TMX and it then worked fine in OmegaT. If you work on Windows, you can drop/drop the TMX file in Olifant (the "old"
That will show you the 74,070 entries in 6 languages in it. you want in that new TMX file. 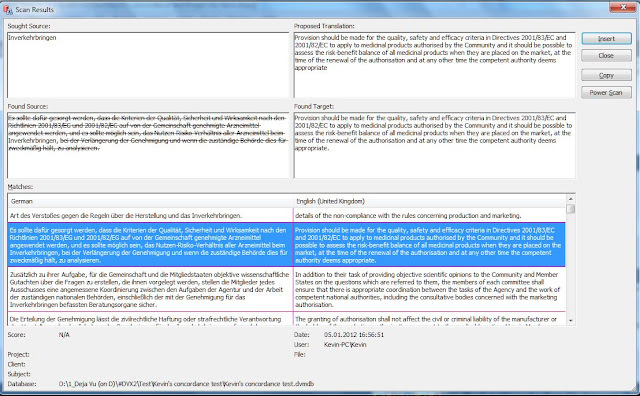 The differences in layout and the lack of highlighting of the key term (which was aligned in the center of the memoQ concordance window in the ancient KWIC display tradition) were unexpected and confusing to the new user. 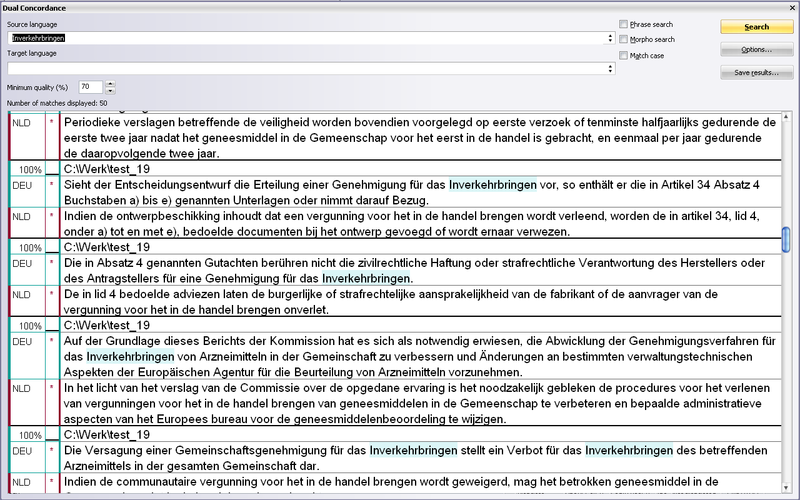 This inspired me to have a look at how various other tools display concordance results. I was not very happy with some of what I discovered, especially with some of today's leading commercial tools. 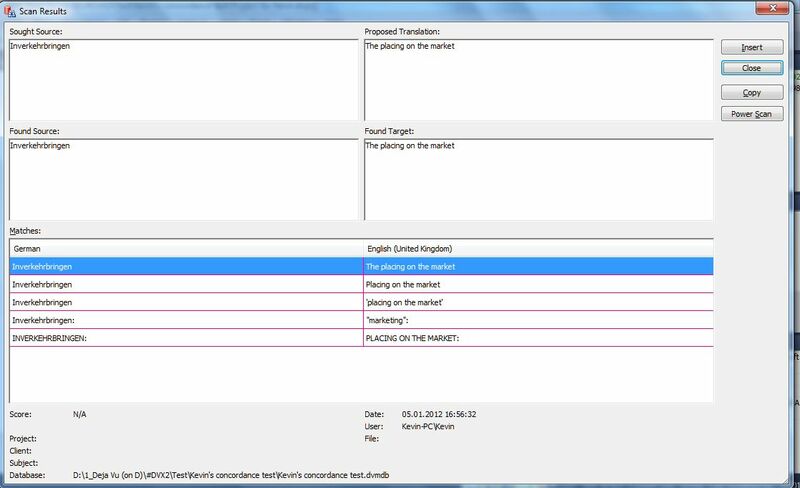 I took a look at the TWB translation memories in SDL Trados 2007, concordancing in SDL Trados Studio 2009, Wordfast Pro (very limited test due to a demo license and my inability to load my TMX test data), memoQ and OmegaT. So it looks like some development attention may need to be directed here. (Update: Kilgray's develops are actively working to remove this restriction.) 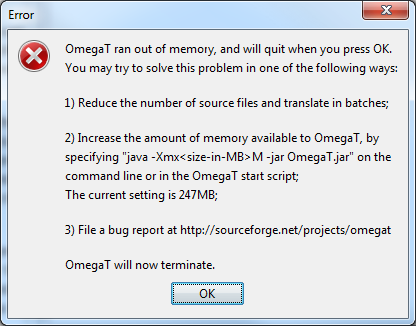 Of all the tools I was able to test with a large concordance, memoQ was the only one to fail this way. 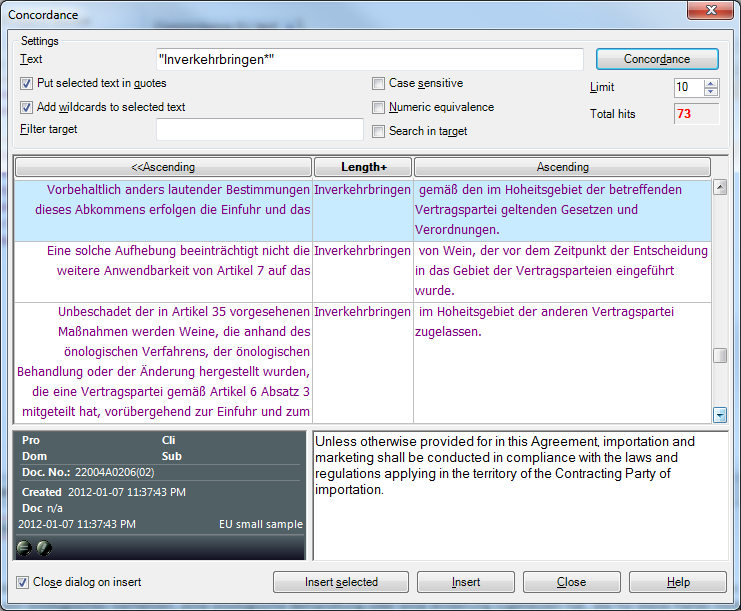 My personal TM with about 10 years of my work in it is nearly as long as my German/English EU legal test database, but concordance searches in it using memoQ are not unduly slow. As you can see, there are many ways to display data from a concordance search. Which do you find easiest to deal with? 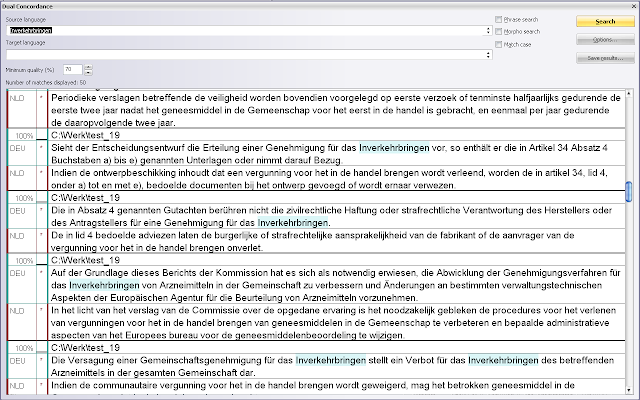 Personally, I love the insertion features of the memoQ concordance, but for readability I think some of the other tools are better. And I do like to know how many results I can expect from my data, and I might even want to view them all. Social media: a waste of time?